For full of comfort is my heart; / Soft reposing. wie Gott mir verheißen hat: / der Tod ist mein Schlaf worden. So the Lord hath promised me, / And death is but a slumber. Whom Thou hast made mine eyes to see / By Thy favor. dass er sei das Leben mein / und Heil in Not und Sterben. Now I know He is my Life, / My help in need and dying. And to His kingdom called the earth, / Ev’ry nation. durch dein teuer heilsam Wort, / an allem Ort erschollen. By Thy dear and wholesome Word, / In ev’ry place resounding. zu ‘rleuchten, die dich kennen nicht, / und zu weiden. By Him are they who dwelt in night / Fed and lighted. Er ist deins Volks Israel / Preis, Ehre, Freud und Wonne. He is Israel’s Praise and Bliss, / Their Joy, Reward, and Glory. 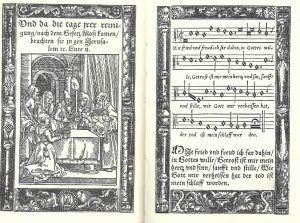 Luther wrote a delicate melody to go with this text, and for centuries tune and text were common in Lutheran Vespers. Whereas the tune he wrote for his paraphrase of Psalm 130 (Aus tiefer not) begins with a dramatic descending interval, the tune to Mit Fried und Freud begins with a dramatic ascent — an entire octave within the first five notes. Simeon’s anticipation of his death is an anticipation of his own ascent. Here is a solo voice singing the first verse of Luther’s Mit Fried und Freud. You may download a pdf of an English translation of Luther’s hymn (with four-part harmony) here. Many composers have adapted this melody for choir and for organ. In 1674, Dietrich Buxtehude (c.1637-1707) wrote a work in honor of his recently deceased father called Fried- und Freudenreiche Hinfarth (“Departure enriched by Peace and Joy”). He intended it as a composition to be sung at funerals. Here is a performance of Buxtehude’s work performed by members of the Amsterdam Baroque Orchestra and Choir, conducted by Ton Koopman. Here is Bach’s Mit Fried und Freud ich fahr dahin, sung by Collegium Vocale Gent, conducted by Philippe Herreweghe. The alto soloist is Ingeborg Danz, the tenor is Mark Padmore, and Peter Kooy is the bass. The final movement to Johannes Brahms’s 1877 motet Warum ist das Licht gegeben? (more on this work soon!) is a four-part chorale displaying Brahms at his most Bachian. It is sung here (along with a scrolling video of the musical score) by the Utrechtse Studenten Cantorij.